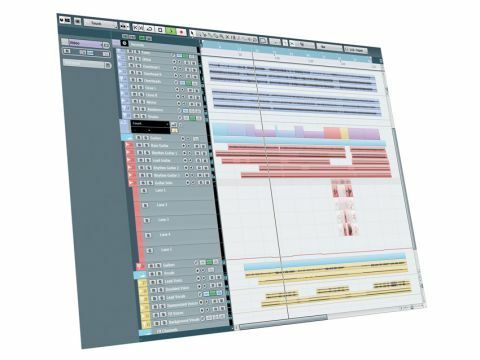 Two years on from its last major revision, does Cubase still have what it takes to compete? This important update, addressing some old gripes, and introducing some genuinely innovative features. Easy multi-track editing. New timestretch and pitch-shift algorithms. Accurate tempo detection. Ongoing 32-bit plug-in integration issues. Comes with less 'content' than some rival DAWs. The graphical updates to the interface are the first obvious update for Cubase 6. Love your funky playing? Instantly create a tempo map that locks the rest of the project to it. Cubase 6 is here, and like any other avid production software geek we got a tingle of excitement while scanning the 'new features' list. The question as always is - will it be a great late Christmas or a hangover of forgotten New Year resolutions? Cubase 5 brought with it the introduction of the very neat VariAudio feature, as well as things like Multi Channel Batch Export, VST Expression and the interesting LoopMash VSTi plug-in. "Our first impression of Cubase 6 was of a graphically more sophisticated interface." The C5.5 interim update saw the arrival of a raft of visual changes - some of which left us pontificating between 'underwhelmed' and 'frustrated' - as well as updates to the Automation functionality, plus the odd efficiency and functional tweak. Since then, Steinberg has issued a statement saying that ongoing support (and testing) for the XP operating system had been dropped. Which is where Cubase 6 comes in. C6 now supports 64-bit versions running on Mac or Windows systems, although 32-bit versions (that run quite happily within a 64-bit OS) are still provided in order to host the large swathe of 32-bit-only plug-ins out there. For the purposes of this review we installed and ran Cubase 6 under OS X, Windows 7 x64 (both C6 x86 and x64) and Windows XP (yes, it works). The eLicenser USB dongle requirement applies, as before, and installation was quick and simple, with Cubase 6 picking-up all our preferences from the previous version (which still runs fine). On loading an older project, our first impression of Cubase 6 (once we got our bearings) was of a graphically more sophisticated interface. Many of the tweaks that were carried out in the previous updates have now been consolidated, and having carried them through to all areas of Cubase, give a consistent feel to all the windows. The Mixer windows appear darker than before - our original reaction to C5 as well in fact - but there is plenty of tweakability if the defaults don't satisfy. However, it does seem that differential colouring of the various track types (MIDI, Audio, FX, Group etc) has been removed, which does make navigation on big projects a little harder than before. MIDI and Audio parts in the Project window have also seen an overhaul, but newly added appearance Preference parameters allow a considerable degree of control over these. We should point out at this stage that there appeared little difference in the way of CPU hit between the different versions, and stability appeared generally good. Let's not beat about the bush (no pun intended), one of the biggest omissions in Cubase has been its ability to compete with ProTools - and more recently Logic 9 - with regard to tempo/hit detection and beat quantising or replacement, especially when multitrack recordings were involved - as is often the case with acoustic drums or multi-mic guitar cab recordings. Cubase 6 brings all of these to centre stage, and Steinberg are clearly proud of the results. Our excitement got the better of us, so we decided to give Cubase 6 a quick test. Using the new HALion Sonic SE plug-in (more on this later), we loaded up a suitable drum kit and played a short segment of 'live' drums from our MIDI master keyboard. We recorded the (pretty bad) result to an audio track, and selected Tempo Detection from the Project Menu, hit Analyse and waited for the results. Very quickly, a Tempo track became visible with tempo changes automatically inserted on each down beat. It should be added that we did not play to a click in the first place, or even begin at the beginning of a bar - this might as well be a random recording dumped straight into program. Playing back the original beat with the metronome enabled proved that the two were both now locked together. This is truly excellent, and makes tempo map creation a breeze, although there are additional functions available if you need to deal with more tricky material. Things don't stop there. If you want to shoe-horn your 'free drumming' into a fixed tempo project, just select 'Set Definition From Tempo' from the Audio menu, and the tempo changes will be hard wired to that particular audio event. By enabling 'Musical Mode' in the Pool the event will automatically track any changes in the Project tempo by timestretching or pitch-shifting the audio. The new élastique Pro time algorithms, really are infinitely superior to those in C5 - in fact they are quite amazing. It's worth pointing out that these tempo definitions can be stored within a project, or as part of an audio file's metadata - especially useful for reusability across multiple projects. Hitpoint detection has also been improved. We always found that although quite good on some material, the earlier Cubase algorithms seemed to require quite a lot of tidying-up, and were especially prone to placing hitpoints before the main transient peak of certain drum hits. We can confirm that there is a most definite improvement in C6, with much more accurate placement of the hitpoints using just one click. The Sensitivity slider has been replaced with a 'Threshold' control to determine how many hitpoints to use, which works in a manner similar to a noise gate (familiar to users of the Detect Silence function), and gives clear visual feedback. Cubase 6 is now very well-equipped in the multi-track editing department. Although there are no radically new and different synth-based instruments provided with Cubase 6, there are two noteworthy examples of progress on Steinberg's part. HALionOne has been dropped in favour of HALion Sonic SE, their new sample playback VSTi. HALionOne, although sonically good, was most definitely limited in terms of functionality. HALion Sonic SE however is the little sister to the full featured HALion Sonic workstation, and provides multi-channel access to a range of very high-quality sounds, featuring much more in the way of editing and flexibility than before. In fact, mixing, effects and control are much more developed here, and even disk streaming is utilised to accommodate growing content size. HALion Sonic is a VST3.5 instrument which means it is also capable of working with the new 'Note Expression' feature - part of C6's VST Expression 2 technology. VST Expression was Steinberg's way of addressing standard MIDI editing limitations when it comes to Key Switching and other performance controls. VST 3.5 instruments can now automatically transfer articulation setups for every sound to an Expression Map. But the real revolution here is the aforementioned Note Expression functionality - a completely new way of assigning, recording and editing performance controllers on a note-by-note basis. What this means is that each note - even those playing simultaneously - can have their own controller data. Combined with the general principle of VST Expression, Steinberg really seems to be onto something here, and it points the way to an interesting future for software MIDI. Steinberg has clearly had an eye on the competition when it comes to plug-in processing, and this has borne fruit in the form of the new VST Amp Rack - although, it should be added that most other changes to the FX plug-in armoury of Cubase 6 are nothing more than cosmetic. VST Amp Rack is a guitar amp simulator that goes much further than the older and more spartan 'AmpSimulator' plug-in. Amp Rack is different beast altogether, incorporating as it does emulation of a full guitar recording chain from Pre-Effects (guitar stomp boxes), through Amplifiers, Cabinets and Post-Effects (more stomp boxes) to Microphone Position and Master output (with EQ and a Tuner thrown in). We were pleasantly surprised by this plug-in, and it is great way of adding realism, vibe or grit. It is often difficult to sum up major DAW updates (of any flavour) without listing what they left out - and in Steinberg's case often what they put in, and why! However, without sounding like a starlet's Oscar acceptance speech, we think Cubase 6 is an exceptionally good update to a solid workhorse of a production system. They have, at last, addressed issues regarding multi-track editing, and have also vastly improved its tempo and beat detection capabilities. By incorporating the simply stunning 'élastique audio' algorithms its time and pitch manipulation tools are second to none. Individual 'Note Expression' points in a very interesting direction, and offers something genuinely new for those requiring precision control in the MIDI realm. VST Amp Rack fills a hole in the Cubase plug-in palette, making it far more rounded and self-contained than before, and the interface now feels more coherent, incorporating all the changes that began with Cubase 4. This brings us to what might be missing. There are ongoing issues with using 32-bit plug-ins in the 64-bit version of Cubase utilising Steinberg's sometimes problematic VSTBridge (although there are better third-party solutions to this problem), but this issue will become less important as developers update their ranges to the new format. Although, Cubase still does not offer true mixer grouping (apart from the existing fader linking feature), it is now possible to add plug-ins and assign send FX across tracks simultaneously, which a simple but important addition (so new, it's not even in the manual). When Cubase 5 arrived two years ago, one major point of contention was that Logic came with much more 'content' (loops, samples etc), and had, on the face of it, a more comprehensive range of instrument and effect plug-ins. We still feel Steinberg need to address this, but this shouldn't detract from Cubase's suitability as a well-rounded and self-contained production software. As far as we are concerned, Cubase 6 is a resounding success.